The resignation of Justice Anthony Kennedy in June 2018 has left an opening for the far right to achieve a clear majority on the Supreme Court. Trump has nominated Brett Kavanaugh, a federal appeals court judge from the conservative legal establishment with a history of partisan politics, contempt for international law, and uncritical deference to Executive power. His confirmation would undermine constitutional protections for millions of people. The NLG opposes the nomination of Kavanaugh, and all the nominees put forth by Trump and his advisers at the Federalist Society and Heritage Foundation. NLG members are currently contacting Senators, speaking in town hall meetings, writing analyses from a critical legal perspective, signing opposition letters from law faculty, and working with other organizations to review documents from Kavanaugh’s time in the Bush Administration. NLG is a member of Alliance for Justice, which has more information on judicial nominations generally and on Kavanaugh specifically. For immediate action steps, please see the Brett Kavanaugh Action Resources Toolkit by AFJ which includes sample letters, call scripts, Senator’s contacts, media samples, and steps for both individuals and organizations. We urge our members and supporters to educate themselves on Kavanaugh’s record and to oppose his nomination. In addition, we encourage the Guild and the broader legal community to challenge the right-wing takeover of the courts at every level. During his tenure, Kavanaugh has adjudicated more than 1,500 cases. Please take a look at the non-partisan Congressional Research Service overview of Kavanaugh’s cases. The consumer interest non-profit Public Citizen has compiled an analysis of Kavanaugh’s opinions in split-decision cases. Opponents of his nomination have compiled information on his decisions related to women’s rights, labor, the environment, and international law as well as many other core human rights issues. The National Women’s Law Center has created a Supreme Court Toolkit to contest Kavanaugh’s nomination. They have also put together a number of fact sheets on his positions on Roe v. Wade, abortion access, birth control, sexual harassment, healthcare, and women’s rights at work. Kavanaugh’s nomination was met with swift and strong opposition from the labor movement. Here is a rundown of Kavanaugh’s worst labor cases by the Director of the Labor and Worklife Program at Harvard Law School. Environmental groups are deeply concerned about what Kavanaugh’s confirmation would mean for environmental regulations and policies. Earth Justice put together this FAQ to explain how Kavanaugh is likely to affect SCOTUS decisions on the environment. Kavanaugh has made no secret of his disregard for international law, as past NLG President Marjorie Cohn has described. When asked about Guantanamo detainees, for example, his response was that international law “doesn’t matter.” He has not referred to human rights in any of his cases, indicating little interest in the obligations of the United States under international human rights agreements. In addition to these areas of concern, opponents of Kavanaugh have pointed to his record on capital punishment, disability rights, gerrymandering, affirmative action, LGBTQ rights, and much more. Across the board, his confirmation would lead to hard shift to the right in almost all areas. This week is Kavanaugh’s confirmation hearing. Now is the time to call your Senators (especially people from the target states below!) and tell them to vote NO on Kavanaugh. 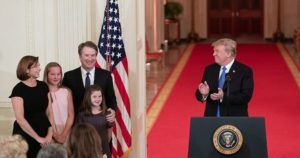 Please join the NLG and allied organizations in contesting Trump’s nomination of Brett Kavanaugh!